I bought a demagnetizer and I tried to demagnetize a Raketa mechanical alarm clock. When I put the alarm clock near a compass, the needle is attracted to it. Both the north and south poles of the needles are attracted to it and neither are repelled. So does that mean the alarm clock is not magnetized? I did an experiment with the demagnetizer with a paper clip. The compass needle is attracted to the paper clip with both poles after using the demagnetizer. When I use a magnet to magnetize the paper clip or just leave it on the demagnetizer without slowing pulling it away, the paper clip will now only attract one pole of the compass and repel the other pole. I'm not sure how this works. I appreciate any help. Thanks! When you turn the demagnitizer on with a compass directly near it you should see the needle flail. The needle doesn't flail, but it just snaps to the area in the middle of the square on the demagnetizer when I turn it on. I have one of those blue ebay demagnetizers. Like this one pictured here. Last edited by OrangeOrange; 1 Day Ago at 08:26. There's a free app you can use instead of a compass: https://www.lepsi.ch/watch-demagnetizer/ . (Almost) every watch a tool watch. The below blue box is nearly useless. There is no enough power in my experience. Return it if you can and get another one like this. Works great for me. With my limited knowledge, I agree with Odessa200. 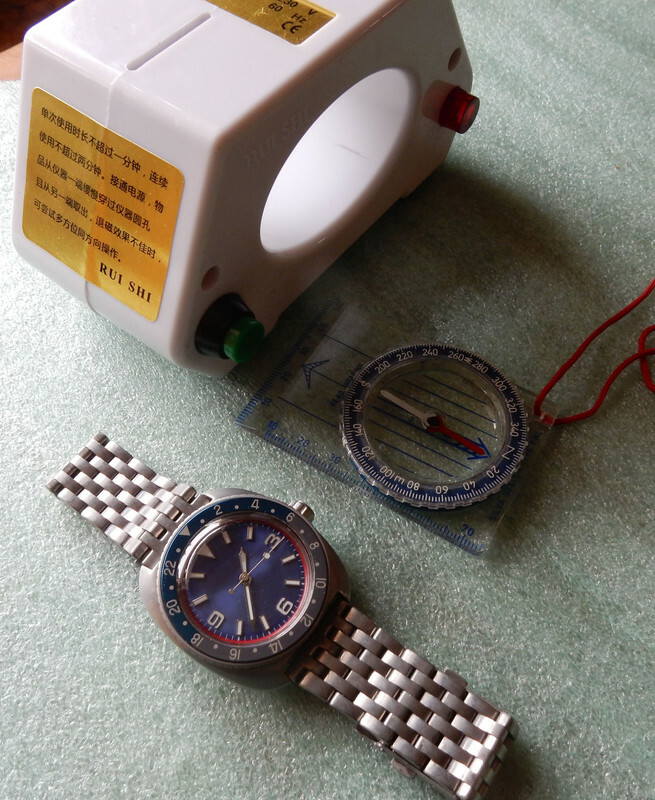 When I checked the watch shown, it kicked the compass needle 20-25 deg. Two passes through the demagnetiser, and it no longer does. The only shortcoming of this model is the size of the inner hole if you want to demilitarize a Vodolaz or similarly oversized watch. That does not fit. Pretty much everything else fits just fine. Pass through type definitely works better, and sometimes I feel as if the blue one either doesn't do anything or makes it worse. I don't own the pass through type, but I have used it in the past.